The cookies have by far become the most popular post on Baked Perfection. 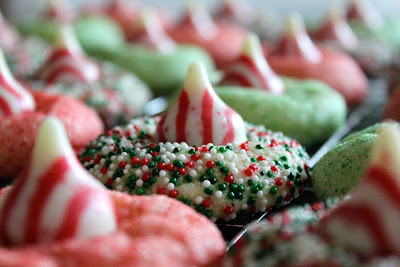 I made them last year and they became an overnight hit on Pinterest. Therefore I decided to make them again for you. This time I rolled a third of the cookies in Christmas colored non-sprinkles to make them extra festive. These cookies are really delicious and you should definitely try to make them! Note: A couple people commented on my last post that these cookies came out flat for them. A couple tips, don't roll them too large and make sure your butter is not too soft or warm. If your dough is too sticky, just add up to 1/2 cup more flour. If you are just going to remove all the comments, why not just disable comments? I actually enabled comments again earlier this summer. 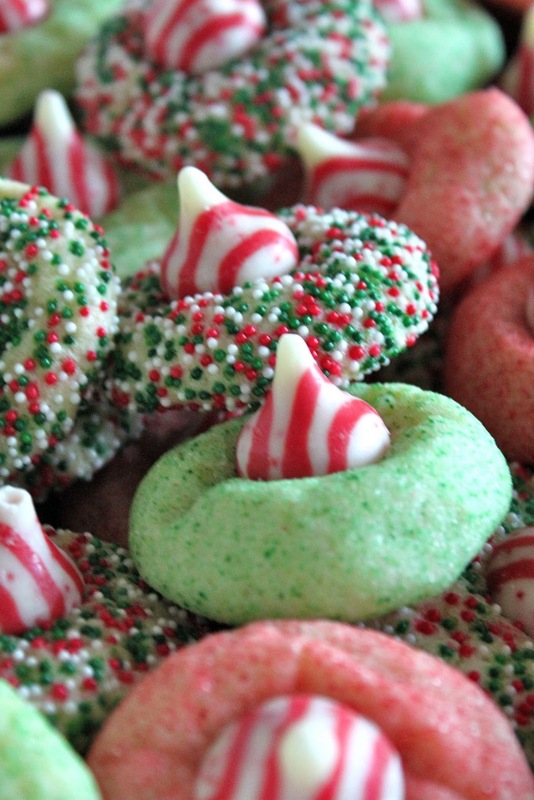 Added to our Christmas cookie list! These look like so much fun and will be a great complement to peanut butter blossoms. Thanks so much for posting! Rachel, That would definitely work! Do u apply the white/red/green dots before or after baking? And where do u find colored sugar? I don't recall ever seeing it. Colored sugar is just the fine sprinkles you find in the baking section. I have honestly never tried, but I think it would. I use Almond Milk in everything instead of reg milk and I like it much better!! Great flavor! And I use the 30cal. It works great and has much more flavor. I use Almond milk for everything! LOVE it for cooking! These are so festive looking I really want to add them to my other cookies. I need to make them within the few next days though. Do you know if they will freeze well? Thanks so much! These do freeze really well. Just let them come to room temp before serving. Make sure to store in an air tight container. I want to know if they freeze well also? Anyone know? Thanks! I think they would be great for a bake sale. When do you apply the sprinkles? Roll the dough into balls and then roll in sprinkles before baking. When do apply the sprinkles? If i want to make a larger batch should i double the amount of each ingredient? That would give me about 60 cookies right? Yes, double everything and you should have about 60 cookies. Do you apply the sprinkles before you bake the dough or after? Add the sprinkles before baking. What do you mean by "Christmas colored non-sprinkles"? I am curious what non-sprinkles are. Thanks! I definitely meant Nonpareils, The red, white and green sprinkles pictured. I have used both and never had any problems. I've heard that if you use salted butter to eliminate the salt in the recipe, but I've never done that and like I said no problems. I don't think it matters. Can I use store bought dough to make these cookies? I put the kisses on while the cookies are still warm, let the kiss melt a little and then press down slightly on the kiss. The kiss then looks like a hard peppermint candy. Can I freeze the dough and save baking until the day of? I love to bake, and decided to try this recipe. The problem I had was when putting the kiss on, the cookies crumbled. Any suggestions/ideas as to why. My cookies are turning out flat! I followed intructions so i wonder whats wrong????? They came out flat & look terrible. I did your tips but they still were flat. Big disappointment. Mine too! I tried chilling the dough on my second batch. Still flat. I made this recipe today. They did turn out a little flat, I asked around and was recommended to next time chill the dough in the fridge (once they are rolled into balls) so they don't spread out as much during the baking process. Of course I messed one up ;) and had to try it. Delicious and cute despite being a little flat! I just made these, very easy. I waited about 5 min. before I put kisses on. Then I put them in refrigerator for about half hour, this stops the kisses from melting. They came out great!! Mine were flat too! So disappointing. I tried chilling the dough and still they were flat. What is the preparation time? I find that cookies will turn out flat if the butter was softened or melted in the microwave. Let butter soften at room temperature or grate cold butter to save time. Another reason could be the leavening agent (baking soda) was expired. Check it first by dissolving a spoon of soda in a cup of warm water. It should fizz and bubble up if it is fresh. I always buy fresh before the holidays. I just made these cookies and they were delicious.My kids love them. Thanks. Followed your recipe and cookies came out perfect, they look just like the picture and they are delicious!